Thousands of high school students in Newark staged a walkout and blocked a major roadway to protest plans for changing the city’s school system. 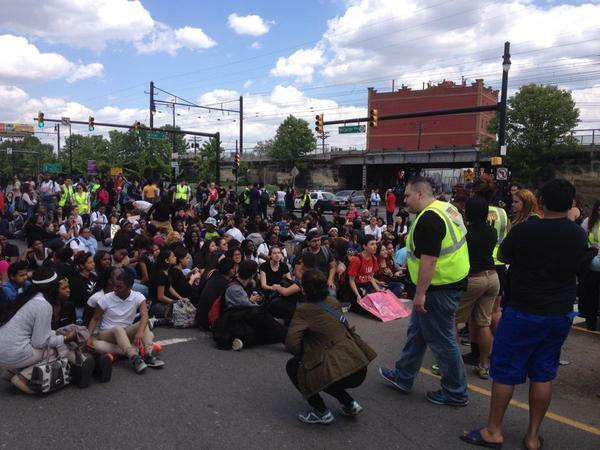 Thousands of high school students in Newark, New Jersey staged a walkout of school and blocked a major roadway on May 22 in what organizers say was the biggest student protest in the city’s history. The walkout was in protest of Gov. Chris Christie and Superintendent Cami Anderson’s plans for changing the city’s school system through expanding charter schools, shutting down and merging public schools, and shifting students to schools farther from their homes. The students are also protesting against Anderson’s “turnaround” program which requires teachers to work longer hours, undergo two additional weeks of training in the summer, and work on multiple Saturdays. Currently more than 20 schools have been designated as “turnaround” schools, and Anderson is planning on adding nine more schools to the program. “Given Cami Anderson’s achievement record, we know that this is just another reform attempt to close nine more public schools in the city,” Roberto Cabanas, an organizer with NJ Communities United, told ABC7 Eyewitness News. The walkout, organized by NJ Communities United and the Newark Students Union, began around noon with students from various schools walking out of their classes and rallying at City Hall. The students, numbering well over a thousand, then marched down Broad Street towards the Peter W. Rodino Federal Office Building, where they occupied the entrance plaza. The students then staged a blockade of the intersection of McCarter Highway and Miller Street, near the New Jersey Turnpike and other major highways, blocking traffic for about 20 minutes. Motorists on the highway, like Asbury Park resident Francisco Duprey, did not seem to mind the traffic delay. Another motorist, Cassanda Gold, whose daughter attends one of the schools participating in the walkout also supported the students. Students had a speak out on the highway and then dispersed around 2 p.m. The protest lasted about two and a half hours without any major incidents. Newark’s mayor Ras Baraka voiced his support for the protest. But Newark Public Schools spokeswoman Brittany Chord Parmley stated that the district, unlike the mayor, could not come out in support of the students.